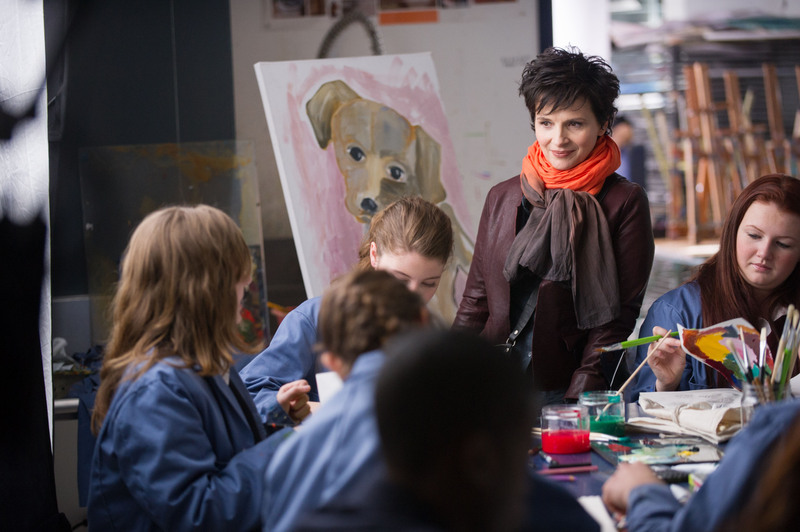 Juliette Binoche stars in Fred Schepisi’s WORDS AND PICTURES. ©Roadside Attractions. CR: Doane Gregory. HOLLYWOOD—Asked to name his favorite five-syllable word, Fred Schepisi responds without hesitation: Quintessentially. In the romantic drama, British actor Clive Owen plays a New England prep school English teacher who is saddened by his students’ obsession with social media and good grades rather than engaging with the power of the written word. A one-time successful author, Jack has suffered writer’s block for years, so he fills his spare time with drink, which has gotten him into trouble at work. Still, his advanced placement English students adore him as he passionately tries to share his love for literature and language in the classroom. He meets his match in French actress Juliette Binoche, who plays a new art teacher at the school She is an abstract painter, who was once celebrated for her art, but has been all but sidelined by rheumatoid arthritis, a condition that makes it painful for her to hold a brush. From their first meeting in the teacher’s lounge, the two damaged souls flirt and provoke each other. With his job on the line, Jack hatches a plan to galvanize his students by declaring a war between words and pictures, confident that the former can convey greater meaning than the latter. Dina and her art students accept the challenge, and the battle lines are drawn. Schepisi, 74, explains in a telephone interview that he was intrigued by screenwriter Gerald Di Pego’s story, which he thought was a great relationship tale about adults facing adult problems. Q: You’re Australian, your leading man is British, your leading lady is French, and the film is set in Maine. Schepisi: (He chuckles.) And I’ve got an Iranian playing the headmaster. That’s the way society is now, though. I thought it was good to have an opportunity to reflect that. Particularly with the students, we have multicultural diversity. It just makes it more real. Q: How did you cast Clive Owen? Schepisi: I knew Clive a little bit from the time he was shooting “Gosford Park.” I was making “Last Orders” in the same area, and we met. We would talk a little bit over the years. I knew he had a love for language and seeing a couple of his earlier films like “The Boys are Back,” “Gosford Park,” and “Croupier,” he knew he had the sensitivity that I thought would be right for this role. When he read the script, he loved the rhythm and smartness of the dialogue, so he was onboard very quickly. Q: And how did Juliette Binoche come aboard? Schepisi: She originally turned us down. We went to someone else, but eventually we couldn’t make her schedule work with Clive’s. By then, Juliette had changed her mind so we went back to her. We got lucky because I had no idea she painted as well as she does, and had such depth of talent and experience. I got a real boon out of that. Q: I This is the first time I’ve seen a character afflicted with Rheumatoid Arthritis depicted in a movie. Did you have an RA consultant on the film? Schepisi: Yeah. Gerry (Di Pego) did a lot of work researching RA before he wrote the script. Juliette did a heck of a lot of work too. I did a lot work as did my production designer and props department. We were extremely well versed in RA by the time we got to do it. It’s not a disease that continues in one direction—it goes up and down—so we had to plot in every scene that Juliette does. We devised a scale of 1-10 pain level that her character was experiencing, and what difficulty that would result in. She had all that down and really didn’t have to worry about it. She could get on with her acting. Q: In the scene where she is lying across the rolling chair on her stomach and painting the canvas below, was that in the original script? Schepisi: No, all of that stuff evolved. None of that was in the script. That and the use of a stick, which was based on the way (French painter Henri) Matisse used to paint in his later years. Juliette came up with the suspended big brush, which is used by a friend of hers in France. We just thought that was fantastic. That’s something audiences have never seen before and it’s dead right for you’d do if you can’t hold brushes anymore. Q: Since your wife, Mary Schepisi, and your star Juliette Binoche are both artists in real life, did they give you input on how to design Dina’s art studio? Schepisi: Yeah, a little bit. We consulted with Juliette on where she would like to paint and how and against what. Mary came around and looked at a few things and gave me feedback on it. We knew we got it right when she wanted to move in. Q: The disintegrating wharf behind Dina’s art studio/apartment and her apartment itself were visually distinctive. Schepisi: Thanks! We searched for a long time to find that. Q: Was it an existing place or did you build it? Schepisi: The broken wharf was there. The apartment, the kitchen and that stuff that looks onto it was there. It was part of a warehouse. What we did with it is that we got permission to open the room that was right off that kitchen and rip through the wall and go into what was a big warehouse, and just build a studio connected to it so it all flowed together. Q: Both Clive’s and Juliette’s characters are respected by their students. Was there a teacher that inspired you? Schepisi: There was an excellent teacher when I was in the monastery. Believe it or not, I was training to be a religious brother. And there was a teacher named Brother Osmund, who was inspiring in English, Latin and geography. He had no idea how his passion for those subjects inspired everybody. On Saturday nights, he used to take us to listen to orchestras. He would say, “Tonight, we’re listening to nothing but the clarinet in this orchestra. I don’t want you to hear the other music; I just want you to hear the clarinet.” He would describe what clarinets do, and he’d do drawings of them and what their role was in the orchestra. So in that detail, he imbued in me a terrific love of music, because while you’re listening to the specific, you’re also experiencing the whole. I realized one day that’s probably the way I work the way I do. Q: For you, what’s it like to have this small, intimate independent film coming out this summer as counter-programming to the big popcorn movies? Schepisi: I’m hoping it works. (He chuckles.) I think it might. I’m sure certainly for an older audience, they’re more likely to go and see it. It’s been my experience that young adults are into this picture very much, if they’re interested in movies. To get a story and see something quite realistic and actually has something to do with them too, they seem to be enjoying it a lot. Q: Do you have a favorite five-syllable word? Q: Is it based on a true story? Schepisi: It’s based on a novel about immigrants from Italy coming to Australia in the late 1950s. They face all the prejudice from being different and foreign, even though there was a lot of immigration going on. Then, two generations later, when his granddaughter falls on hard times, the only refuge she has is this farm where she knows nothing about and certainly doesn’t want to be there. It’s a terrific, powerful emotional and romantic story.